The interview featuring Idina and Taye and their work with A BroaderWay aired on the Today show this morning. Check out the video below! It’s a great interview. 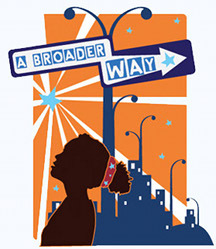 If you wish to find out more about A BroaderWay, check out their website here. I’d like to say thank you to everyone who has donated to our yearly hosting fees drive! 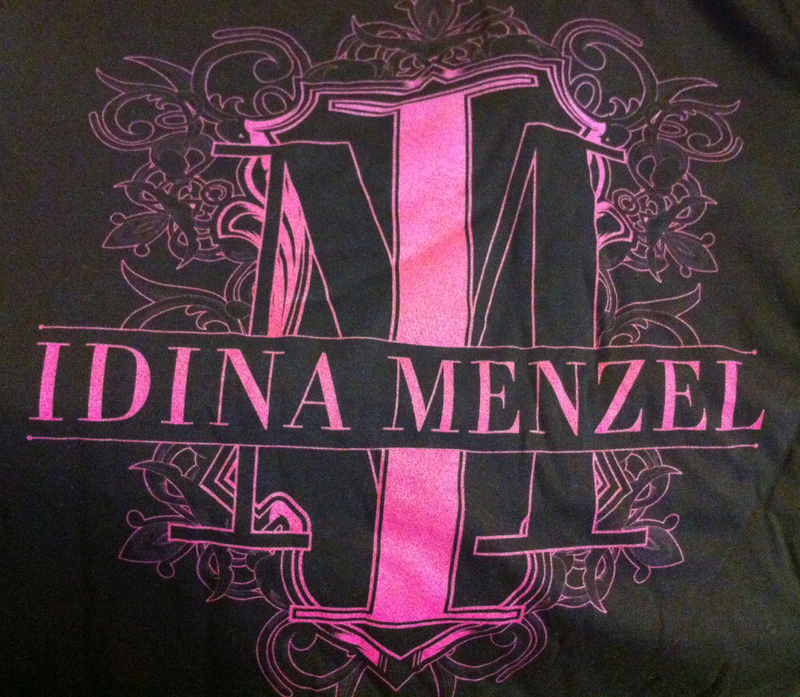 Donations from now until September 30th will be eligible for a grand prize pack of an Idina t-shirt and signed pic! Check out the details in this post. It’s that time of year again when Idina-Here.com asks for help in paying the annual hosting fees. If you enjoy this site, please consider clicking on the button below to donate to our hosting fees fund. Even a dollar or two can make a big difference! You can also see more information on the donation page. -If you choose to donate $10 or more, just click on this button to be taken to Dreamhost’s PayPal page. The money goes directly to the hosting fees (not to me!). -If you choose to donate less than $10, you must use PayPal to send me the amount at Jill(at)idina-here.com and I have to transfer the money to Dreamhost. They’ve recently changed the minimum amount of donation that is accepted for the direct transfers. And as an added thank you, I’ll randomly choose one donor of $2 or more to receive a prize pack of a t-shirt and signed headshot. Donations will always be accepted, but I’ll choose one winner on September 30th, so donate by noon EST on September 30th to be qualified as a participant. I appreciate any donations of any size! I am looking forward to all to come in the next year, with the release of Frozen, Idina’s return to theater, and whatever else she has up her sleeve! We’ll have lots to post and talk about! Speaking of Idina’s return to theater, a little sneak preview of If/Then has been released! Check it out! TV Alert: A clip about Idina’s A BroaderWay charity and camp is supposed to air on the Today Show on Thursday, September 19th. Continuing on our theme of fun new videos from Idina, here’s one just posted today! Awhile back, Idina’s charity A BroaderWay participated in Samsung’s Hope for Children campaign. Through social media, the charity that received the most votes was awarded a grant from Samsung. A BroaderWay won! As a thank you to the highest voter, Idina and Taye made a fun little video while at the airport waiting for their flight to head to camp. You’ve never heard “I’m Not That Girl” like this before! Idina has been promoting and fundraising for her charity A BroaderWay recently and one of the places she performed was the NY City Center on July 25th. Check out this beautiful performance of Idina singing “Imagine.” It brought me to tears! If/Then & Frozen updates, plus a contest! 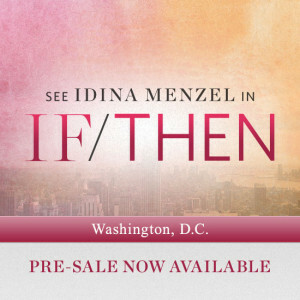 Idina fans have until August 4th to take advantage of a special presale for the upcoming new musical If/Then at the National Theatre in Washington DC this November. 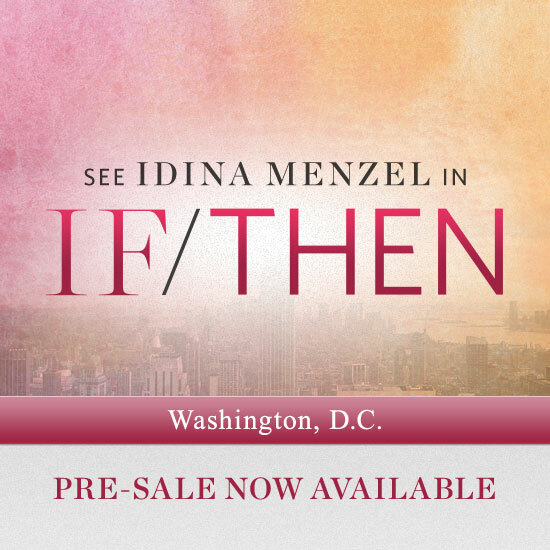 Click here to purchase tickets using the presale code IDINA. 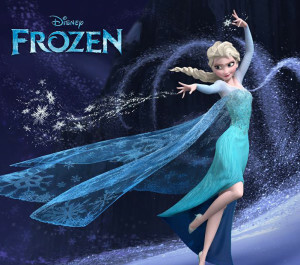 Speaking of November, have you seen the trailer for the Disney movie Frozen? The trailer doesn’t feature Idina’s character, but it’s super cute anyway! Watch here. There have been new pictures released of Idina’s character though. What do you think? 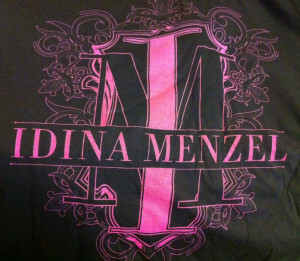 In honor of Idina’s busy November, let’s have a little contest! Just answer the trivia question below and submit your name and email address. I’ll select one winner on July 28th, noon EST to win a t-shirt with the logo pictured below! One entry per person please.